Lena lives in a coastal town south of San Francisco. She has always loved the ocean, the smell of the salty air, the feel of the cold water, and especially the waves. But her father refuses to let her fulfill her fondest wish, to learn to surf. She secretly has her friends teach her to surf, but in the process, she discovers something far more fascinating than surfing. She catches sight of a beautiful mermaid, and her life will never be the same. This is a lovely book with an interesting heroine, a fascinating magical premise, and a strong contrast between Lena’s life on land and her life in a mermaid world. I read in an interview with the author that she originally intended this to be a middle-grade novel. Some traces of that aim at a younger audience remain in the book, for example the characters eat and drink soup and other liquid foods down under the ocean. This is the kind of quirky touch that is most often found in books for young children. However, other than that, this G-rated book can be enjoyed by teens of all ages. Girls will especially enjoy that there is a significant romance subplot. There are also fascinating relationships between Lena and her mother and grandparents in the undersea world of the mer-people. The author of this book (whose real name is Lisa Wolfson) died of cancer on February 23, 2011. She announced on her website in January, 2011 that she had pancreatic cancer and that she had made peace with her impending death. 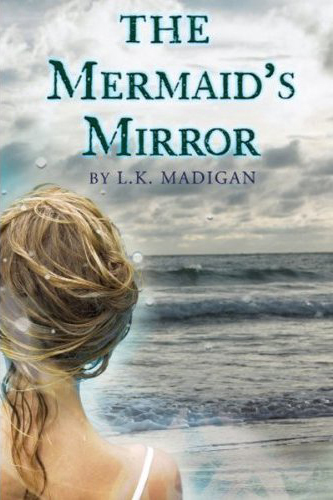 The Mermaid’s Mirror was her second book for young adults. Her first book, Flash Burnout , won the William C. Morris Award, a national honor given by the American Library Association to the best book for young adults by a first-time author. It was also a finalist for the Leslie Bradshaw Award for Young Adult Literature. If this author had been granted more time among us, I am positive she would have had a very successful career writing for young people.